Quick and delicious, could these plantain chips be the perfect substitute for white potato chips? One test is how do you feel after eating a small handful of each? Do you feel bloated, yet still want more (potato chips)? or do you feel full and energized (plantain chips)? The plantain is a variety of banana that is lower in sugar than its popular cousin, the Cavandish banana. It provides a broad spectrum of nutritional benefits from iron, magnesium, and potassium to Vitamins A, C, and B6. Admittedly, nothing quite satisfies like the crunch of a perfectly fried potato chip. 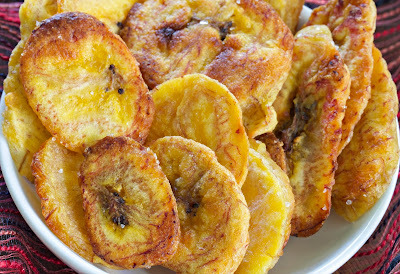 But these plantain chips, baked in coconut oil with just a bit of added salt, are a much healthier option. 1. Melt the coconut oil in a small pan; pour into bowl large enough to fit all the banana pieces. 2. Score the banana skins lengthwise very carefully in 3 evenly-spaced lines around each banana. Peel off the skin. Slice the banana at an angle as thinly as possible (chips cook better if thin). 2. Toss the banana pieces in the slightly cooled coconut oil and lay carefully with tongs on baking sheets covered with silpat sheets or parchment paper. 3. Bake for 20 - 30 minutes, or until they are cooked through. Remove pieces as they turn brown and leave others to finish if necessary. 4. Sprinkle with sea salt and serve, or store in a container for a few days. Recipe adapted from The Fed + Fit website here.